The fencing you install around your property is the first thing people will see. It is important that the fence gives the message you want to send out. For example, if a fence is purely decorative, then you are looking to install something aesthetically pleasing but not necessarily high or barrier-like in nature. On the other hand, if the main purpose of your fence is to keep animals in or intruders out, or to maintain privacy, then the height, strength and durability of your fence are the most important factors. You need to think critically about what task your fence needs to perform and what budget you are working to. For example, if you have a large area, such as a farm, to fence, then using the most cost effective material is probably better than using the most aesthetically attractive materials. 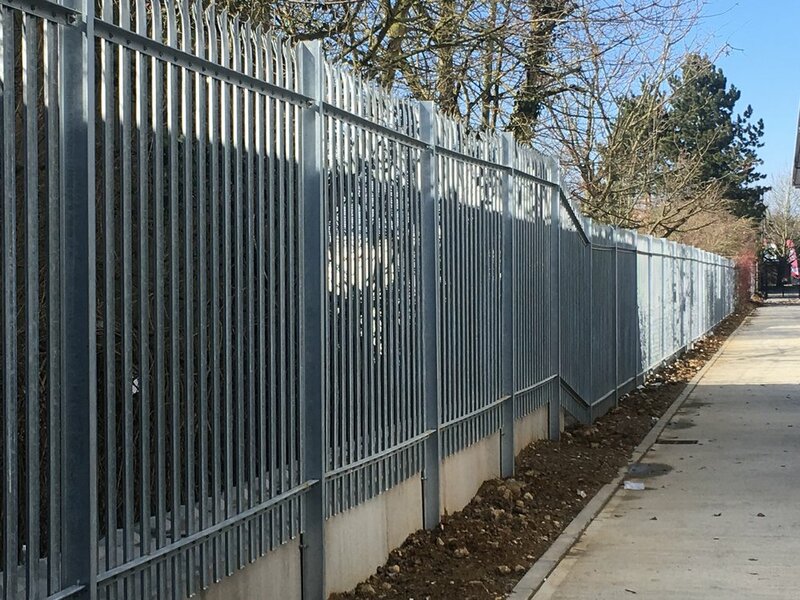 Two projects we have recently completed demonstrate the range of fencing that can be used for security, with different materials suiting different purposes. In our first task, the brief was to make an industrial unit secure. The client wanted durable, strong, intruder-proof fencing that would deter people from trying to break into the premises. For this project we used 2.4 metre high section palisade security fencing with top and bottom rails. The rails were fixed with anti-tamper fixings and the posts had three-notch spikes on top to further deter intruders. The posts were sunk into a concrete base. This entire project was about security and durability. The Palisade fencing is manufactured from cold rolled steel and has a galvanised finish to to help protect from rust over time. Clean lines, high fences, triple spike deterrents. While this was an industrial unit, this type of fencing is suitable for agricultural areas, railways, yards and any high security buildings. Our second project was a garden fence that needed to serve several different roles. It had to act as a demarcation for a property boundary; it needed to offer a level of privacy and security; it borders woodland so it needed to keep animals out, and it needed to look aesthetically pleasing. Our client chose close board panel fencing (also known as featherboard). It is strong and versatile and also looks good. It is also cost effective because, if quality materials are used, the fence will enjoy a long lifetime. The timber, vertical slats of a close board fence provide a simple backdrop to the garden, which means that as the garden is planted, the fence will make a natural border, allowing the plants and flowers to be the stars of the show. The fence also offers wind resistance and is also ideal for any uneven landscaping such as rises in the ground or tricky corners. We used 1.2metre high panels supported by three horizontal bars. The panels were fixed to concrete posts and the base was concrete to give added stability and durability. All the fixings are stainless steel throughout. These are just two of the many fencing options that we offer at Dodd & Co. We don’t believe one size fits all when it comes to fencing but rather, that every fencing solution should be unique to the task it is expected to perform.